Yup, that’s what we have here, a load of rubbish that needs to be cleaned up, contained and disposed of. There is no better way to do this than by using rubbish bins. 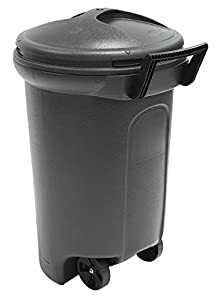 However, not every rubbish bin is good, just like with any object that has a purpose, it must have some basic features and standards to conform to. So here is a guide to the perplexed rubbish collector, and we all collect rubbish. This guide will review four rubbish bin types; outdoor container bins, rubbish bin accessories, indoor trash can and outdoor decorative bin. 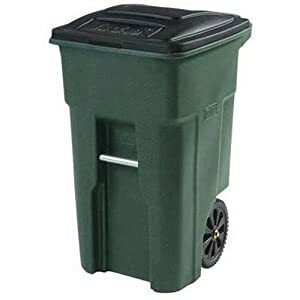 The main review will be about outdoor rubbish bins with wheels, and before we begin, here is a quick look at the features required to choose the best outdoor rubbish bin. Size: How much rubbish do you want to collect in one area? Strength: How sturdy is the design and materials used for containing and handling the bin? Mobility: How easy is it to fill, move and handle by public or private rubbish collectors? With these three features, let’s take a look at what would be the best choice for you. Note: For bio-hazard and other dangerous waste products, you will need to buy a special bin designed and fabricated with materials specifically for those waste products. 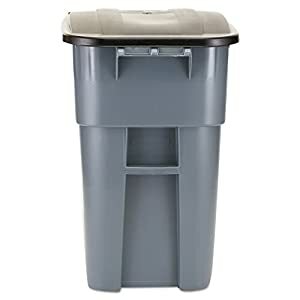 When it comes to brand names synonymous with quality, you don’t get much better than the Rubbermaid Commercial BRUTE Rollout Trash Can with Hinged Lid. This brute of a container comes with industrial standard wheels aimed for full mobility, ease of use and easy maintenance. A locking mechanism, so it doesn’t roll around when left standing, a slid weight lid for maintaining security and integrity. A push and pull holding section to make it easier for you to move it around, and a molded-in catch bar for automated curbside lifting. The hinged lid is designed for a quick snap down sung fit. This model is a recycling model, so it comes with the recycling symbol imprinted and painted on the plastic. Bottom Line: This is a sturdy leader in the industrial and residential garbage recycling sector and can be found on every street in the US. If it’s a secure, efficient, and well-known garbage solution that you seek then this will give you great value for money. 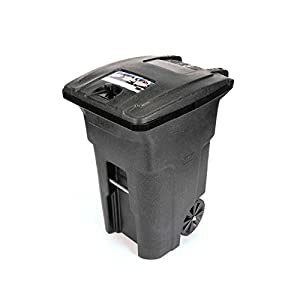 Toter produces some great garbage collection solutions, one of them is the curbside heavy-duty plastic molded trash can. 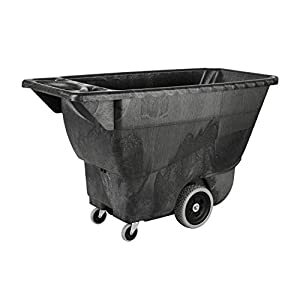 This model holds 32 gallons of waste, has a molded-in axle connecting two industrial standard wheels and a standard curbside automatic collection bar for easy collection. The material is a sturdy green stone plastic with a standard black plastic lid. This model comes with a 10-year warranty that is a testament to this model’s stability and durability. 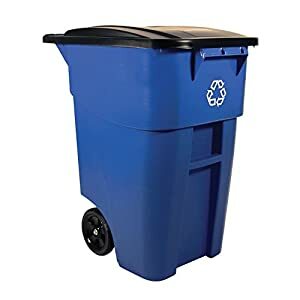 Bottom Line: This is a very strong bin, also very good size for residential and commercial use. This is another great Rubbermaid garbage disposal solution; it’s their circular 32-gallon trash can solution that comes with all the features you would expect from a Rubbermaid model. The body is a polypropylene injection molding with commercial style rubber wheels. It can be sued for storage as well as for storing liquids and of course garbage. Bottom Line: This is very lightweight storage and garbage bin. Multiple uses, affordable price and from a well-known and reputable company. 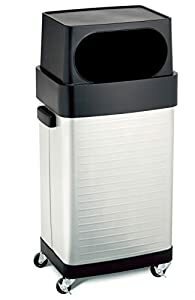 When it comes to brand names synonymous with quality, you don’t get much better than the Rubbermaid Commercial BRUTE Rollout Trash Can with Hinged Lid. This brute of a container comes with industrial standard wheels aimed for full mobility, ease of use and easy maintenance. A locking mechanism, so it doesn’t roll around when left standing, a slid weight lid for maintaining security and integrity. A push and pull holding section to make it easier for you to move it around, and a molded-in catch bar for automated curbside lifting. The hinged lid is designed for a quick snap down sung fit. Bottom Line: This is a lighter model than the recycling version but retains all the strengths of a Rubbermaid bin. The lid is more streamlined, and this one would actually look good on any front lawn waiting for curbside collection. 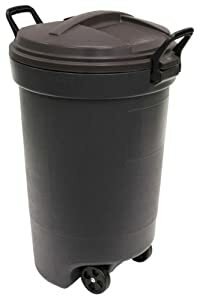 This is the Tote 64 Gallon; Bear Tight Garbage Can. It comes with a reinforced lid locking mechanism and is made of single mold polyethylene. The wheels are industry standard, and the rim has a steel reinforcement insert. The lid is also secured by ¼” steel u-bolt hinges that make it easy to lift and close. Bottom Line: This is a big bear of a bin. It is aiming for 64 gallons of content, and yet, even when full to the brim with heavy weighted rubbish, the wheels move smoothly, and the automatic loading bar lifts the bin effortlessly without bending or buckling the bin body. 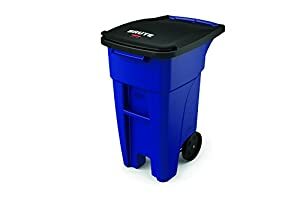 United solution is the owner of the Rubbermaid brand and produces quality items under two brand names; this is their United Solutions brand of the bin. It’s designed for critter prone area’s and has a critter proof solution to maintaining the integrity of its seal. The lid has a snap-on the mechanism that makes it harder for prying paws to open. The material is a thick polypropylene which is more scratch resistant than standard plastics, and it comes with commercial style wheels for extra maneuverability over rough floors. Bottom Line: This is a very lightweight unit, under 8lbs and is totally critter proof, os it’s a safe bet for any home that has issues. The Rubbermaid Commercial Tilt Dump Truck is made for large loads. This is not your standard residential bin and is suitable for businesses ranging from retailers to manufacturers. The bin is made of a structural foam molded reinforced polyethylene. The load sits on 4 industrial specification wheels, the two main ones are 10” in diameter each. There is a built-in steering unit for easier maneuverability and it can handle loads up to 450lbs. This model comes with an optional domed lid. The unit is designed to be moved by one person and being made of single model polyethylene makes this unit very easy to clean after use. Bottom Line: If its size you want, then its size you will get, if its capacity and durability, then don’t look any further, you will not find a better large indoor/outdoor polyethylene skip solution than this. This is another great Rubbermaid solution, and as I mentioned above, when it comes to brand names synonymous with quality, you don’t get much better than the Rubbermaid Commercial BRUTE models. This brute of a container also comes with industrial standard wheels aimed for full mobility, ease of use and easy maintenance. A locking mechanism, so it doesn’t roll around when left standing, a slid weight lid for maintaining security and integrity. A push and pull holding section to make it easier for you to move it around, and a molded-in catch bar for automated curbside lifting. The hinged lid is designed for a quick snap down sung fit. This model is a standard model, aimed at residential and retail use mainly. Bottom Line: If you are looking for a clean, precise and simple garbage solution, then buy this version of Rubbermaid. It’s easy to maintain and clean and is great value for money. 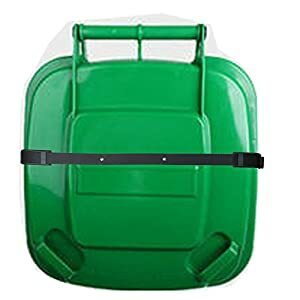 When you buy a bin, you need accessories for carrying the trash to the bin as well as securing the bin lid against critters and other scavengers. This is where you need to choose the right accessory to provide the best solution. These are 55-gallon trash bags designed specifically to sit inside a large 50-55gallon bin. Imagine you have all your home and yard trash just thrown into the outside bin, sometimes bottles and waste leaks, and the bin fills with gunk and spores. Rather than having to wash it out on a regular basis, or leave the dirt to accumulate and stink, why not invest in a bin liner. This provides two solutions in one go, a clean environment for all your rubbish, leaving the inside of the bin clean after removal. It also makes the removal process faster and cleaner for the curbside collectors. 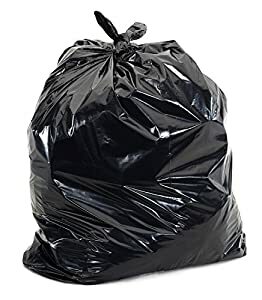 This is ToughBag, a 55-gallon trash bag package that comes in 50 units. It is 1.5mil thick, which believe you me is thick enough not to tear at the first sign of strain. The bag is 35” wide and 55” high and is made of a low-density resin. Bottom Line: A puncture proof, scratch proof bin liner that will solve your bin lining problems in one easy purchase. If you don’t invest in a critter proof bin, then buy a bin belt. These are just like luggage belts but designed for your outdoor bins. They are locks to secure the lid against opening by critters and scavengers and are easy to put on (once) and lock (multiple times). Bottom Line: This is a universal strap that can be used in any bin up to the size of 96gallons capacity. It’s a great little add-on to secure the bin against critters and scavengers as well as high winds with rain. When it comes to decorative bins for the home, I had a hard choice finding the best one. This was the top of our list for home office and general usage. The reason I chose the Seville Classics is based on a number of key factors. These include the integrity of the wheels and the strength of the body as well as the ease and stability of the lid. This bin has it all, and while there is no arguing about style, there is definitely a strong argument in favor of this unit technical and performance specifications. Body: Stainless Steel with resin lid top. Bottom Line: The unit comes with 2 wheels and locking feet so when you need to move it around its easy, and when you settle it in place it doesn’t budge. It’s a solid, strong and durable bin and should be in every home or office. This is an outside decorative bin that can be easily placed in any garden formation. It doesn’t stick out since its designed to be “invisible.” The color is a deep brown, and it has a wood-like an appearance. The lid is secured by hinges, and the whole unit is made of durable resin. 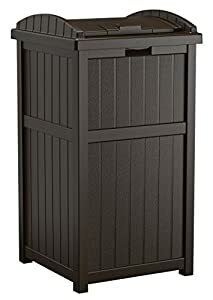 Bottom Line: If you want a strong, “invisible” yet fitting designed bin for your yard and garden, this is a great unit to take home. It’s large enough and strong enough to support all your gardening and yard garbage needs. As with any product, there are good and bad versions. Waste bins might be overlooked by most consumers, but when you are involved in the waste cleaning and reclamation business, the container is the key to your success. A good container has to provide a number of features and functions, the first being the ability to contain garbage in a safe and hazard free containment zone. Now you might think that’s an easy thing to do, but material science has proven that when hundreds of different garbage types get chucked into a container and mix up, they can react and become corrosive to many materials. That is why the material in the bin is made of must suit the waste content being added. Another key factor is a weight-bearing strength. As you fill a large bin, it becomes harder to move. If the bin design and material are not suitable for handling heavy loads, the bin will bend crack and break. Or, you might not be able to move it due to design deficiencies. That is why the body must be made of a specific load bearing material in a load bearing design and must be placed over a maneuverable system of wheels that can support the weight. This means to support the weight for years; you don’t want a bin whose wheels lock up or fall off after a week or a month. The next thing to look out for is total containment. Do you need to cover the bin, yes you do? It’s not enough you have a lid, you need a solid lid that is heavy enough to resist wind and withstand scavenger tampering. That leads you to need good hinges as well as a bend free lid with possible locking mechanisms in place. Apart from these main features, you need curbside collection bars to enable the garbage disposal trucks locking mechanism to hold it and lift it for quick removal. This means that the locking bar has to be an integral part of the bin body and be able to withstand thousands of uses. The overall mechanism, wheels, and lids must be made of durable and reliable materials that are able to withstand years of frequent usage, especially since most homeowners don’t maintain the wheels or lid hinges. There are four bin types that you will need in a residential setting: These are the small wastepaper baskets, the larger office and kitchen bins, recycling bins and finally outdoor collection bins. Recycling bins have to be color-coded, so in most cases, the body will be made of a colored resin that is either green, yellow or blue. Non-recycling bins are usually black or grey. If you want a quiet and smell free life outdoors, invest in a solid bin made with EN 804 standards. Buy a brand model and make sure it matches the type of content you throw away. If you are a commercial site, I suggest you consult with a health and safety specialist that will counsel you on what brand and model to buy.